The Gude Drive Airfield and the surrounding area was once owned by the Adolph Gude family. Gude ran a large nursery near the site until the middle seventies complete with rail service and a full size airstrip. The Gude house still sits on Crabs Branch Way as a Maryland Historical Trust site. Montgomery County acquired the site for a landfill that was active until the early eighties. Pipes collect methane gas from the landfill. The gas then powers generators producing electricity that’s sold to PEPCO. In 2006 an outdoor furnace was erected to burn off the methane as it was not profitable to maintain the electric generators. 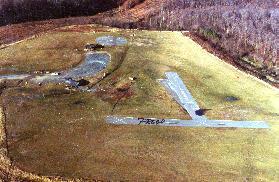 In 1975 the District of Columbia RC Club (DCRC) and the county opened up the Montgomery County Model Airplane park. The park had electricity in the Gazebos and running water. Two runways were built along with two flying circles for control line. 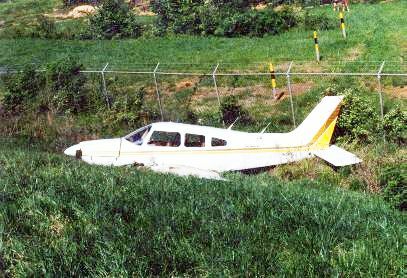 A full sized single engine plane crash landed on the access road and broke through the railing in 1978. The crash is still evident today. The field was closed in 1985 due to a noise complaint. Over the years nature reclaimed the field and it became overgrown with Locust trees and tall grasses. In 1993 Roy Smith on behalf of the Capital Area Soaring Association (CASA) worked out an agreement with the county allowing RC Sailplanes and Electric planes to fly at the site. Along with the help of a bush hog rented by CASA, Roy and Richard Shaum started clearing the site and opened the Gude Drive Field. Over the next three years the field’s boundaries were pushed back exposing most of the original layout of the Model Air Park.